OMG I love “facebook stalk”!!! Hahahhaahahah. I love that.. “he got cheek/chin/ lip was that a kiss?” Sadly I can soooo identify with that and all those other phrases about awkward dating. I’m the queen of awkward dates. Ugh. Those are the cutest thing I have seen! Brilliant! 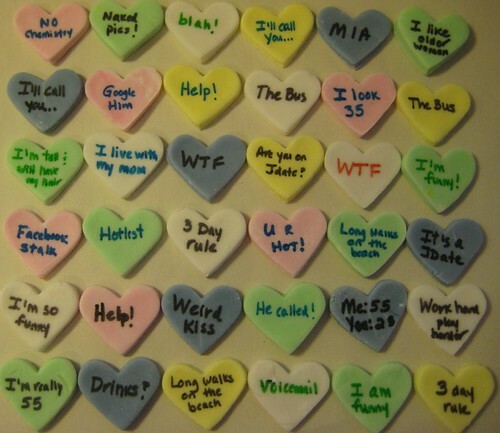 I love the “I live with my mom” one. LOL! I love the “I live with my mom”! That is so me right now! these are adorable!! too bad they tasted weird, i am not sure they were meant to taste good no matter how you make them though. they make great food art! this is ridiculously clever. These are so neat!! Thanks for the great idea. I think I will be making these for the next time I go out so that there is no surprise!! These were funny to read. Thanks for the laugh! I really wish they had tasted better, but I’m not a huuuge fan of the store bought kind either. I think they might be fun to make anyway, just for amusement purposes. pens to write on food with are a great idea! 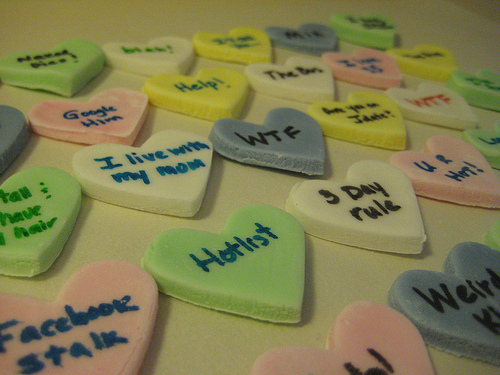 😉 ive found some on amazon not too long ago but i havent ordered them yet coz you can only get them in the u.s… the conversation cookies are such a funny idea – a great way to lay out messages to your other half and a treat at the same time, hehe!